A conformal projection. The green shapes drawn on the map are equal-area circles on the surface of the earth. Known as “Tissot’s indicatrix”, they can be used to show the angular and areal distortion of a map projection. On a conformal projection, the shape of the circles is preserved, but the area is not. On a equal-area projection, the area is preserved but the shape is not. 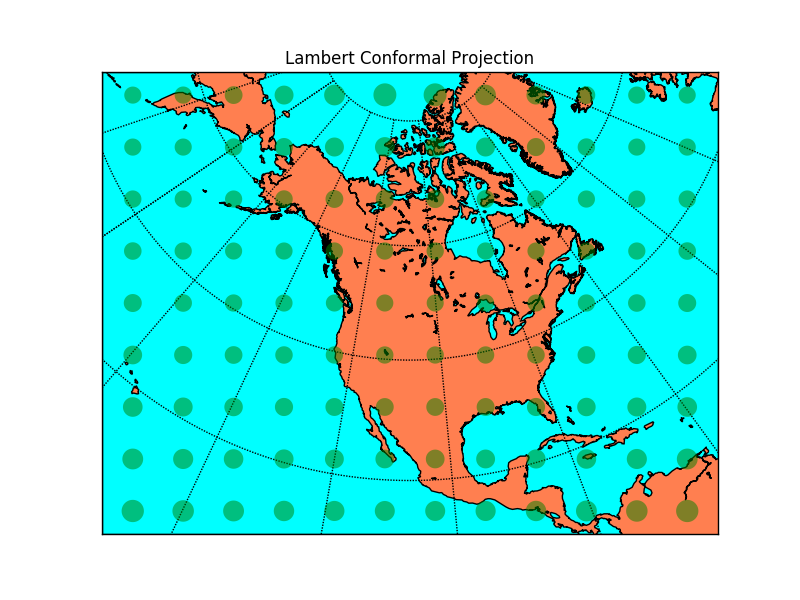 # setup lambert conformal basemap. # lat_1 is first standard parallel. # lat_2 is second standard parallel (defaults to lat_1). # lon_0,lat_0 is central point. # than 1000 km^2 in area. # draw tissot's indicatrix to show distortion.